Today I came to talk a little bit about a product that I received for free for test purposes from Influenster. The product is the Dew Drops Coconut Gel Highlighter from Marc Jacobs. I have been trying this product for couple days and I can say that this one is pretty different. Is not a cream, and it does have a lot of pigmentation. Also the smell of coconut is pretty good. The texture of this gel is really dense but easy to apply. I believe that is better to apply with a little sponge or some brush to make it evenly. Here below is the picture of the product on my Instagram (go ahead an follow me there). I also posted on my instastories a picture with a basic make up on and using this highlight. That is the picture, and this product leaves a nice natural gold glow to the skin and I just loved it! If you are looking for a natural highlighter this one is really good. But my tip here is blend right after apply the foundation. 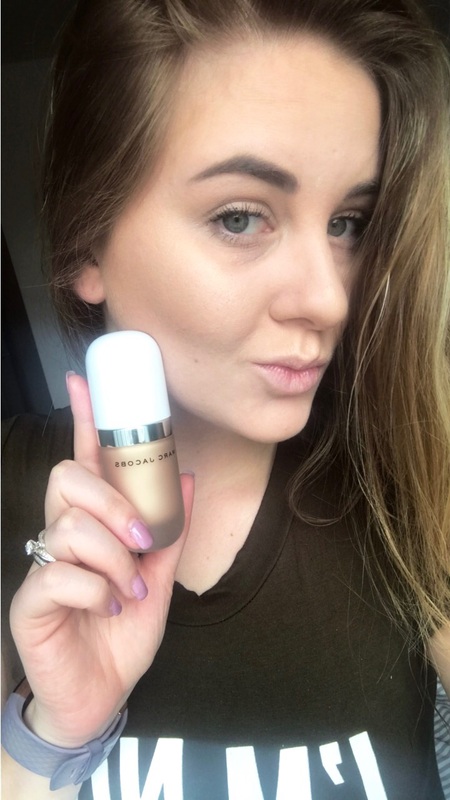 Since is a gel highlighter it will be wet, so is good to do not wait too long to the foundation set, because other way it will have a cakey look – trust me, I already try it. Or apply mixed with your foundation for a lite glow looking skin. You can find this highlighter straight from Marc Jacobs website (click here) or on Sephora (click here). Let me know if you already tried this new Coconut Glow highlighter from Marc Jacobs, on the comments below or on my facebook page. If YES , what do you think about it? And if NO, do you want to try? See you all in the next post, and don’t forget to follow me on Instagram and subscribe to my Youtube channel, and also like my page on Facebook!